REMBRANDT VAN RIJN (1606–1669) was one of the world's most accomplished graphic artists. In his drawings the Dutch master used pens, chalks, or brushes to capture pose, expression, form, and shadow with quick decisive strokes. His drawings vary from minimal touches to create a smile, a breeze in a tree, or the eddy in a current of water to elaborate treatments of the details of a face, a complex biblical story, or the texture of wrinkled skin. Rembrandt's drawings are most often suggestive rather than highly finished, and his genius shows in his telling strokes where shorthand intimation converts to convincing vision. 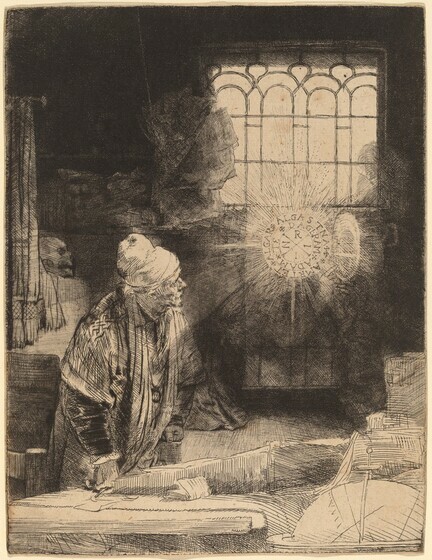 In his early prints Rembrandt mastered etching, using acid to bite varying depths of lines he drew through a protective ground covering the copperplate. Single strokes established the edges of forms, and irregular patterns of cross-hatching suggested variations in light and shadow. He added further subtleties of tone with drypoint, scratching directly into the copperplate to make sharp strokes, throwing up ragged edges of burr that created lines with soft edges like lengths of yarn. Rembrandt achieved broader patterns of tone by biting the surface of his copperplates with brushstrokes of diluted acid. Rembrandt often changed the lines on his plates to revise his images, producing what are called new states of the plates. In his quest for richer atmospheric effects he learned to vary the amount of ink and thus the clarity of different parts of his plates. He discovered how to achieve further variations by printing on different types of European paper, parchment, or vellum, or on the oriental papers just beginning to be imported to Europe. In these ways Rembrandt treated his prints not as finished works but as the bases for further experimentation or elaboration. As he grew older, Rembrandt became ever bolder, both in the individual strokes he used to create an image and in the radical changes he might make to it. In this assertive image Rembrandt portrayed himself as a Renaissance gentleman. Dressed in luxurious sixteenth-century vestments, a jauntily tilted beret, and a chain and cross, Rembrandt confronts the viewer with a self-confident, penetrating gaze. The etching emulates two famous painted precedents that Rembrandt viewed at auction in Amsterdam — Raphael's portrait of Baldassare Castiglione and Titian’s Portrait of a Man. Like many of his Dutch contemporaries, Rembrandt often turned his attention to scenes from daily life. At first glance, these images seem to have been inspired directly by the people and events Rembrandt saw around him. Yet their apparent simplicity is deceptive, and some of his humblest genre scenes reveal important information about Rembrandt's artistic methods. Many of the images once thought to be drawn from life, such as his etchings of beggars, in fact reflect the work of earlier artists, including Albrecht Dürer and Jacques Callot. Other scenes have allegorical or even mythological overtones. Similarly, the nudes and studio scenes — more than just straightforward depictions of the human figure — provide fascinating insights into the way Rembrandt constructed his pictures. Rembrandt's genre prints and drawings, like his other works on paper, have found an eager audience almost since their creation. According to an inventory compiled in 1680, collector and fellow artist Jan van de Cappelle (c. 1624 – 1679) owned hundreds of drawings by Rembrandt, including an album devoted to women and children. These sketches served Rembrandt originally as both an artistic exercise and a source of further ideas for figures in his etchings and paintings. In his genre prints and drawings, as in his other art, his ability to imbue even the simplest of subjects — elderly peasants, mendicants, scholars — with profound emotion lends a weight and significance that sometimes provokes centuries of speculation over the precise meaning. The subject of this print has been long debated. Shortly after Rembrandt's death an inventory of the artist's work listed it as a portrait of an alchemist. In the early eighteenth century it was thought to portray Johann Faust, a sixteenth-century magician who, according to legend, sold his soul to the devil. Yet another interpretation identifies the scholar as Faustus Socinius (1539 – 1604), the founder of a heretical Christian sect who sought refuge in the tolerant religious environment of Amsterdam. 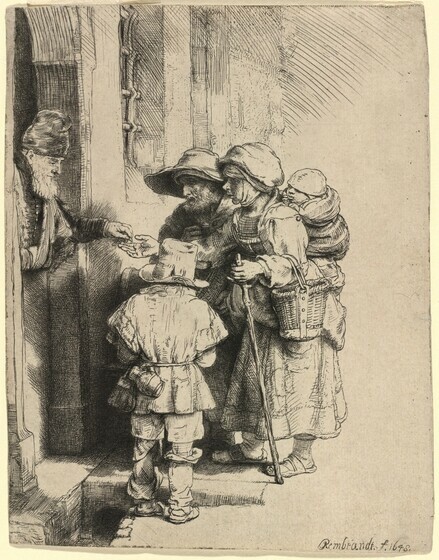 Rembrandt's interest in beggars, peasants, and itinerants continued into the 1640s and 1650s. 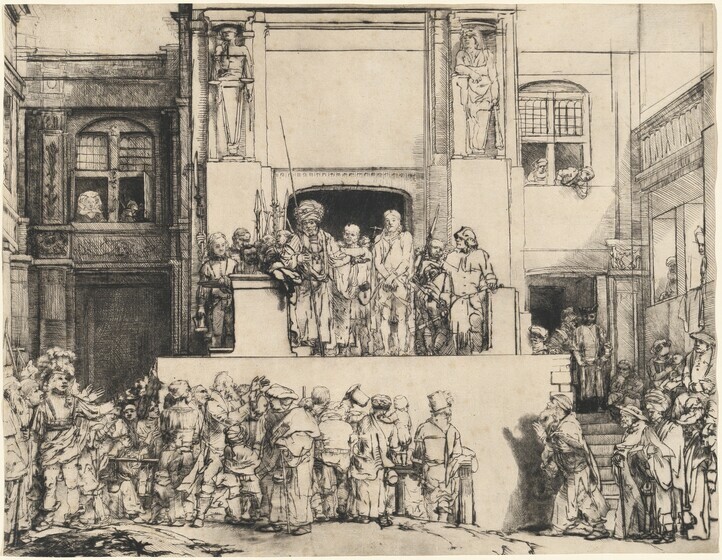 The composition here is more complex and monumental than the earlier prints showing one or two isolated beggars. The man is possibly an impoverished musician, for a hurdy-gurdy is just visible at his side, to the left of the boy's head. Rembrandt's portrait drawings and etchings engage the viewer by conveying the human presence of his sitters. Whether in quickly rendered studies of his own face or in carefully modeled commissioned portraits, Rembrandt captured the emotional and psychological character of his subjects as well as their physical appearance. Rembrandt began making portrait prints, primarily self-portraits and depictions of family members, around 1630, shortly before he left his native Leiden for Amsterdam. After moving around 1632 to Amsterdam, where he met and married Saskia van Uylenburgh, Rembrandt continued to etch self-portraits as his rising fame ensured a continual demand for his images. During the 1630s and 1640s he also received a number of commissions for larger, more formal portrait prints from friends and collectors, among them civic officials, ministers, and other artists. During the mid-1650s, when Rembrandt was experiencing financial difficulties and had to declare bankruptcy, he also seems to have etched portraits as tokens of gratitude for individuals who helped him during this period of personal crisis. Rembrandt not only made portrait prints for friends and patrons, but he also sold them on the open market, where they were admired for their insights into human psychology. He understood how to emphasize gaze and expression by harnessing the effects of light and shadow through the strength and rhythm of his line as well as by the way he inked and wiped his plates. Moreover, he often printed his portraits on Japanese papers, because their warm tonalities enhanced the humanizing quality of his subjects. 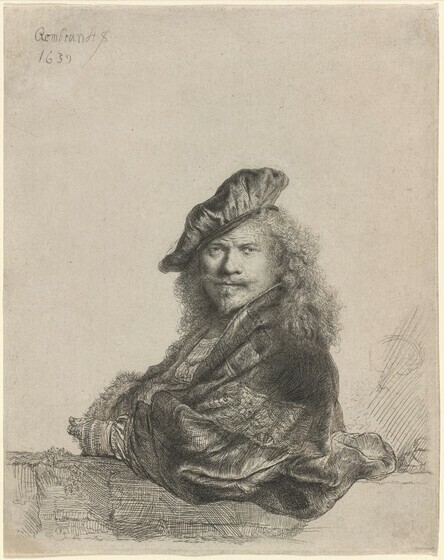 An Amsterdam publisher and print and map dealer, Clement de Jonghe (1624/1625 – 1677) acquired numerous copperplates by Rembrandt during the artist's lifetime. 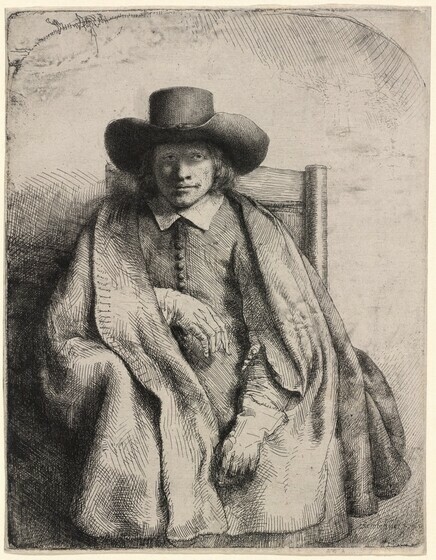 A comparison of the various states of this print reveals the subtle changes Rembrandt made to the sitter's facial expression as he adjusted the light and shade to create different psychological effects. In the first state De Jonghe seems to be smiling, but as the revisions progress, shadows deepen across his eyes and his expression becomes more contemplative. Rembrandt presents himself here as a distinguished gentleman gazing directly at the viewer from the shadows beneath his soft cap. Rembrandt's use of red chalk varies from the delicate lines modeling his face to the boldly sketched smocked shirt. Rembrandt created deeper tonalities in shaded areas by wetting the tip of the red chalk. 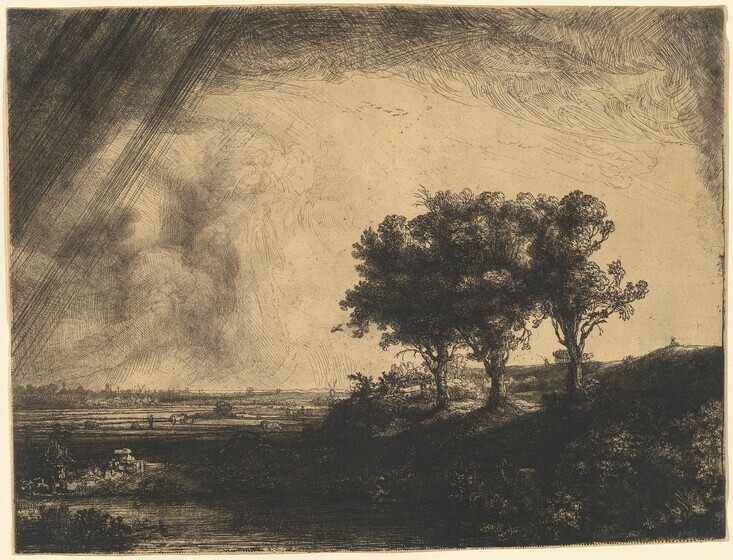 Rembrandt's landscape etchings are concentrated in little more than a decade of his career as a printmaker. His interest in the subject first evolved in painting, and when he turned to drawing and etching, his landscapes became more intimate and responsive to the local scene. Many have been identified with specific locations around Amsterdam, giving the viewer a sense of accompanying Rembrandt along the canals and across the fields outside the city. An inventory of Rembrandt's possessions in 1656 records three albums full of landscapes drawn from nature. The practice of an artist working out-of-doors was relatively new and coincided with the growing acceptance of landscape as a worthy subject in its own right. The region around Amsterdam was notable for its flatness, a defining feature of the Dutch countryside. The dikes that protected the low-lying country from the advancing sea also delineated the well-established routes taken by the artist on his excursions, where windmills, modest country cottages, and farm buildings captured his attention. Rembrandt's most striking contribution to the art of landscape lay in his recognition of the value of understatement and in his ability to convey much with an economy of means. Barely a few strokes suffice to render a city profile or communicate the movements of a tiny figure in the distance. 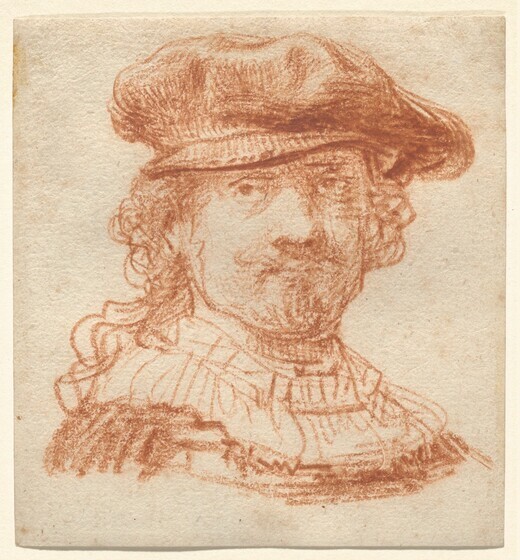 A range of printing techniques and variable inkings applied selectively could suggest atmospheric effects, but Rembrandt also understood the expressive potential of leaving an area blank. His mastery of landscape arises not from a documentary impulse, but rather from his capacity to transform the familiar and unexceptional into something remarkable. 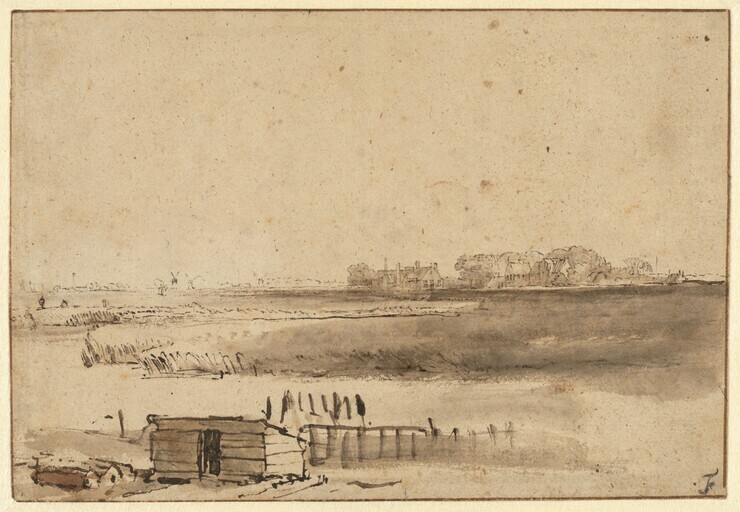 Rembrandt's landscape drawings were made on location and are based on direct observation of the countryside surrounding Amsterdam. This most celebrated of Rembrandt's landscape etchings conveys a grandeur belying its modest size. The silhouetting of the trees and the sweeping view over the dikes to the town provide a foil for the impending drama of the elements that dominate the scene. Close inspection unveils a discreet but engaging human presence: to the right an artist seated on the hillside with his sketchbook and behind him a cart crowded with travelers; to the left a couple beside a pond. Rembrandt grew up in a Christian household, centered on his mother's reading of the Bible. He was officially a member of the Dutch Calvinist church, but he was also reported to be a member of the liberal wing of the Mennonite community, which emphasized adherence to the Bible, personal faith, and charitable works. Religious art was the largest single category in Rembrandt's oeuvre. Contrary to modern emphases on Rembrandt as a businessman, his lifelong production of biblical images was in the face of a declining market for them in seventeenth-century Holland. Rembrandt's images show he read the Bible very carefully. He visualized ancient stories in realistic terms, sometimes influenced by events in his own life, and showed biblical figures with powerful and genuine emotions. In addition, Rembrandt was aware of the traditions and beliefs of other faiths present in the tolerant Dutch capital, where a variety of Protestant creeds, sects, and even mystical groups flourished; Catholics could practice in private; and Jews were welcome. 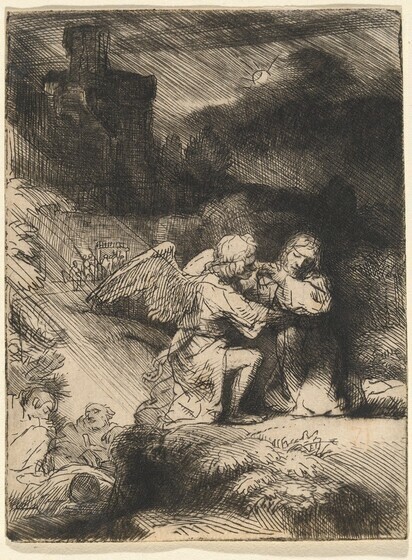 In his religious works Rembrandt was also heir to centuries of biblical imagery, which he knew from his own and other collections of art, especially of prints. There are clear cases of Rembrandt using transformed versions of figures or compositions from engravings by Andrea Mantegna and Lucas van Leyden, woodcuts by Albrecht Dürer, and manuscript paintings from Mughal India. 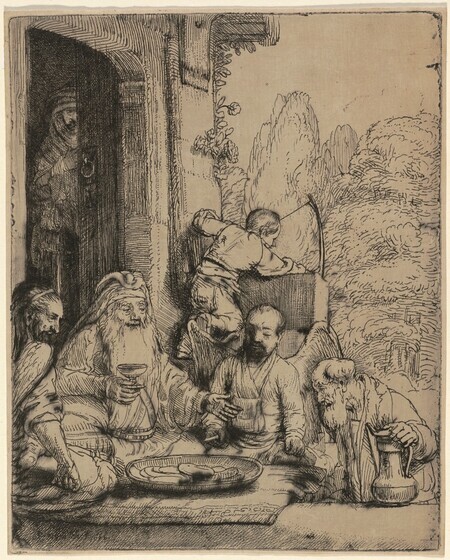 Rembrandt's religious prints and drawings document his developing style as well as his changes of composition, expression, and graphic technique. They also reveal his use of light and shade in his interpretation of religious narratives. The metaphorical use of light and darkness began in Christianity in its first century, occurring in several biblical texts Rembrandt illustrated, but codified above all in the Gospel of John, where Jesus is identified with light that shines in the darkness of the world and is rejected. Rembrandt organized the architecture and the light in this image to frame the story between flat, unadorned, strongly illuminated expanses of the central façade. The top tier is plain, bordered by sculpted figures of Justice and Fortitude. The middle level, with bright walls at either side, features a central darkness from which emerge Pilate, Jesus, and the mustachioed murderer Barabbas. The bottom tier is a stark wall, which throws into relief the foreground crowd of ordinary folk. 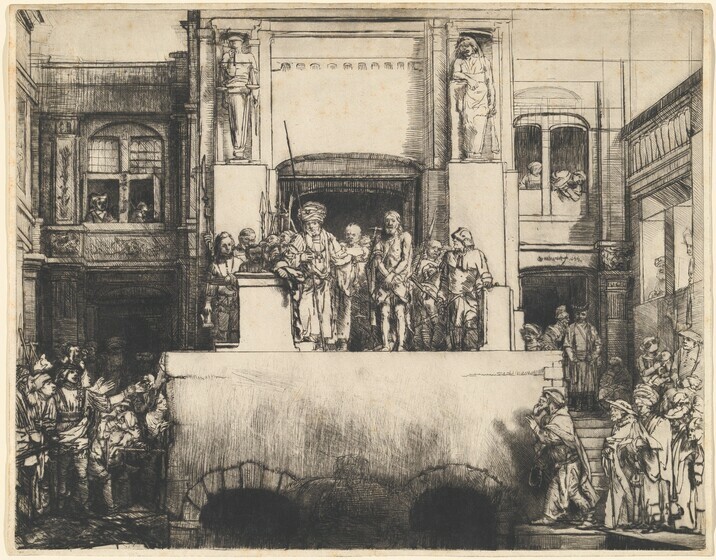 Perhaps because the burr wore down on the plate used to print the previous drypoint, Rembrandt reinforced the delineation of the architecture and almost all of the figures. Yet he burnished out the central foreground figures that had been the focus of earlier states and, departing from the biblical story, replaced them with an aged, bearded figure, giant in scale, half emerging from the ground between two rusticated arches that lead to total blackness. With the redrawn Christ now more prominent, the illumination takes on symbolic status: those on the middle level are precariously balanced between light above and darkness below, presented both literally and as personified by the powers of each realm. The drama of Jesus' agony in the Garden of Gethsemane, as he alternately prayed to be spared from death and then accepted his fate, is reflected in Rembrandt's dramatic lighting. Stormy flashes of light alternate with deep darkness throughout the image, echoing Jesus' troubled spirit. Rembrandt signed and dated this plate, indicating that he considered the image finished. This vivid impression shows all of the figures as clearly as possible — including their individual features, gestures, and emotional reactions — while retaining velvety richness in the drypoint burr. 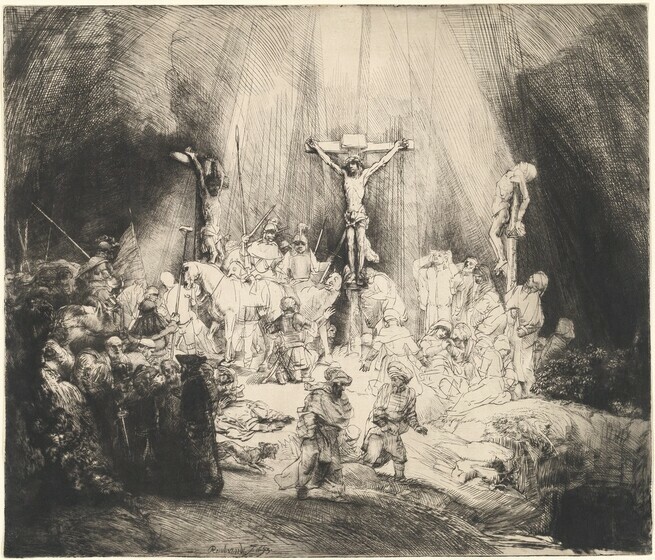 Rembrandt recreated his previous Crucifixion, burnishing the plate to soften or remove many figures and redrawing almost the entire composition. He made the scene more violent and jumbled, with the body of Christ thinner and more fragile; the distress of John (standing on the right) deeper, his arms opened wide; and the suffering of Mary (below him) more complete, her head fallen backward. Most strikingly, the basic meaning of the light has changed. 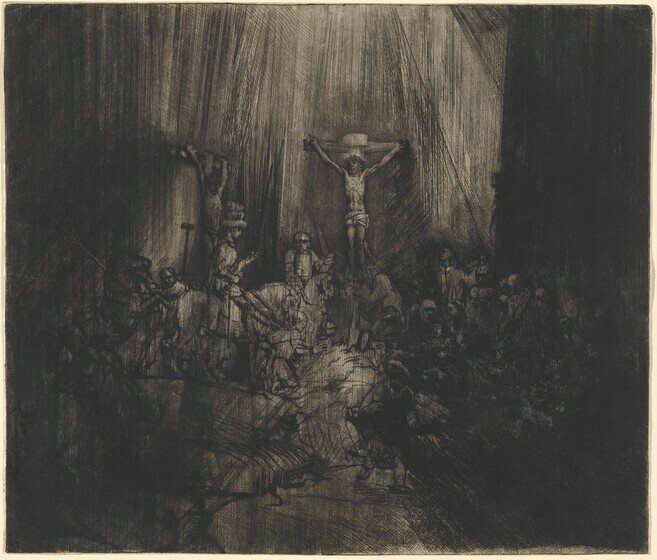 Instead of the radiant light streaming down from above in the earlier version, Rembrandt's slashing strokes of drypoint here have covered almost everything with darkness and inverted the triangle of illumination — the light is leaving the world.